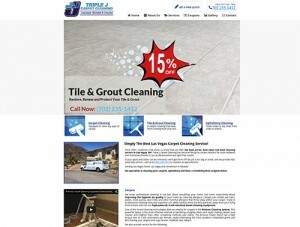 Aliante Web Design is proud to announce the new website for Triple J Carpet Cleaning in Las Vegas. We used php, html5, jquery and CSS3 to create their responsive and mobile-friendly website. 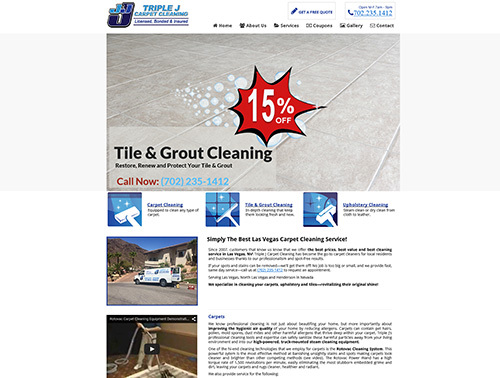 Triple J Carpet Cleaning specializes in cleaning Carpets, Tile and Grout, and Upholstery/Furniture. Their well-trained and educated staff uses high-powered, truck-mounted Rotovac machines. Their cleaning methods and techniques ascertain remarkable results. They are hard working, keep timely appointments, and are true professionals. They ONLY hire the finest people and do a complete background check on each employee! They provide the best in carpet cleaning Las Vegas since 2007.